It’s not the first time this theory has emerged. But it seems to be gaining some traction. CBS in Los Angeles is reporting that the FBI again is saying that the elderly looking bank robber dubbed the “Geezer Bandit” — he’s robbed 15 banks in the San Diego area — may actually be a younger person wearing an elaborate latex mask from a special effects company. 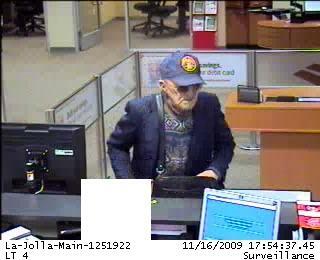 CBS reports that a bank teller who saw the bandit up close agrees that it may be a mask. The man appears to be in at least in his 70s, according to FBI photos. Posted: 11/29/11 at 11:37 AM under FBI, News Story.